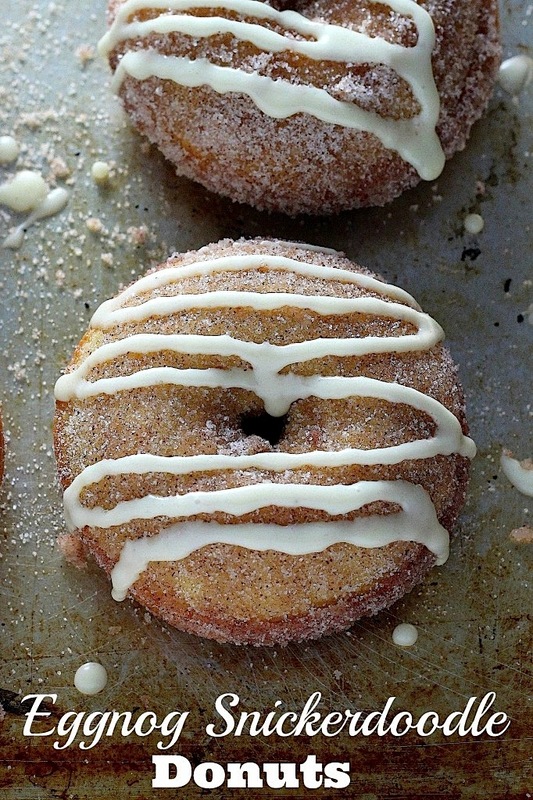 These brown butter eggnog snickerdoodle donuts are insane! So light and fluffy; baked eggnog donuts are coated in cinnamon sugar and finished off with an eggnog glaze. The perfect way to kick off this holiday season! Ok, I know I say this a lot – but for real this time – these are the best donuts ever! I ate the first one in 30 seconds and couldn’t stop talking about it ALL day. The donut batter has a whole half cup of real eggnog in it! So the eggnog flavor really shines through. Once the donuts have baked up into soft, delicious rings, they get rolled in butter, cinnamon, and sugar! SO darn good. To top it all off, each donut gets a swizzle of eggnog glaze. So much amazing flavor in each bite! For this recipe I used the fabulous 1-to-1 Gluten Free Flour from Bob’s Red Mill. We seriously could not taste the difference! Bob’s Red Mill Gluten Free 1-to-1 Baking Flour makes it easy to transform traditional recipes to gluten free. Simply follow your favorite baking recipe, replacing the wheat flour with this extraordinary blend. It is perfectly formulated for baked goods with terrific taste and texture – no additional specialty ingredients or custom recipes required. I highly recommend giving it a try! And if you don’t want to make this recipe gluten free, simply use all-purpose flour in its place. So adaptable! In a large bowl whisk together the dry ingredients. In a separate bowl whisk together the eggnog, browned butter, and egg. In the meantime, melt the butter for the snickerdoodle coating; set aside. Mix the sugar and cinnamon together in a medium-sized bowl; set aside. In a small bowl combine the confectioners sugar, eggnog, and salt; whisk smooth. The glaze should be thick but easily pourable; add more eggnog/sugar as needed. Drizzle a swirl of eggnog glaze on each donut and serve! These are best eaten the day they are made. Wow, these look so good, I may have to break down and buy one of those donut pans! How perfect for christmas time! These look like a great treat! Girl…I have literally clicked over to this post THREE times because I am OBSESSED. Why does the recipe call for gluten-free and regular flour? Is this a mistake? Yes! Thank you for catching that. It’s fixed now! I have never mad donuts before how do you make the hole in the donut does the dough became stiff so you can make a circle? What is a donut sheet? Can you use a cookie sheet or a stone to bake them on instead? Hi Lori. The donut batter is spooned into the donut pan. You can purchase a donut pan from Amazon.com (I’ll add a link to the page in a few minutes). there is no butter listed for the cinnamon sugar coating. Also, did you mean to list baking *powder* or baking *soda*? I only ask because of the cream of tartar. Thanks! Hi. It’s 3 tablespoons of melted butter for the coating. And it is baking powder, not soda. The cream of tartar is optional. But you must add baking powder or the donuts won’t rise. I don’t (currently) own a donut pan. Is this a stiff dough that can be formed and baked on a flat cookie sheet or is it more muffin-like and the donut pan is a necessity? Hi Meg. For this recipe you definitely need a doughnut pan. Has anyone tried these in a mini-muffin pan? Maybe making them more like donut holes instead of full donuts? Think it would work?